Think of these songs: “Chim Chim Cheree,” “It’s a Small World,” “Winnie the Pooh.” The likelihood is you know them, and once reminded, you can’t get them out of your head. That’s the mark of a great song and, more to the point, a great songwriter — in this case two great songwriters, Richard M. Sherman and Robert B. Sherman, who were Walt Disney’s go-to tunesmiths in the 1960s (but whose catalog ranges far beyond just Disney songs). Richard, now 90, was guest of honor at the Academy’s salute to these songs, their movies, and his late brother Bob. I reviewed this warm and memorable evening for Variety. 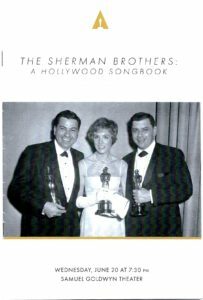 This entry was posted in Composers, Film Music and tagged Academy tribute to Shermans, Richard M. Sherman, Robert B. Sherman, The Sherman Brothers: A Hollywood Songbook, Variety on June 21, 2018 by Jon Burlingame.